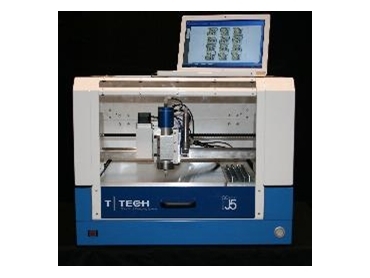 SATCAM announces J5, a new PCB prototyping system from T-Tech Inc. J5 is the latest addition to T-Tech's range of precision milling systems for PCB prototyping. Following on from the Model 5000 and Quick Circuit HF, J5 adds productivity features such as automatic tool change and depth control, local control of machine settings and full 3-axis control with a Z-axis range of 60mm. J5 PCB Prototyping system includes features from previous models such as choice of 60,000 or 100,000rpm spindle, "Pre-Touch" pneumatic non-contact pressure foot system, 4-zone vacuum table, integrated sound enclosure and optional TraceCam USB camera for visualisation of the work area. Milling speeds of up to 75mm per second can be achieved, with drilling rates up to 180 holes per minute. Work area of this PCB Prototyping machine is the same as Model 5000 and HF at 250 x 330 x 60mm. As well as PCB prototyping, J5 can be used as a general purpose 3D precision CNC milling system. Add Quick Plate for electrolytically plated through holes and you've got a complete PCB prototyping system.